Below is a guest post by my favorite politician in Lebanon, HMA Tom Fletcher, the British Ambassador to Lebanon. Lebanon tends to be high on our August watchlist. This year there was no major single crisis, but five developments raised anxiety. Israel accused Hizballah of involvement in the Bourgas terrorist attack. A pro-Assad former Minister was arrested. Kidnappings returned in a dangerous 48 hours. Some Gulf countries told their nationals to leave. The Tripoli powder keg re-ignited. Throughout, the media were quick to accentuate the negative. Lebanon has learnt to live with a certain level of instability. Periodically, for millennia, it has gone through phases of fragility, as regional tectonic plates and delicate demographics shift. The result is often conflict and political realignment. Are we in such a phase? Not yet. But I think there is an increasing realisation among Lebanese that Assad’s ability to directly influence political life in Lebanon is reducing. The system of Syrian patronage, reinforced over 30 years through brutality and corruption, is unravelling. This is a difficult but necessary phase. There is uncertainty, hedging, and recalculation. The Lebanese are quick to blame outsiders for their woes. But what has changed over the last month is that there are clearer signs that both sides in the Syrian conflict are more willing to provoke or respond to violence within Lebanon, especially in Tripoli. As ever, conspiracy theories abound. To the optimist, there are positives: the Lebanese army has responded well; mainstream political leaders are trying to find consensus, including through President Sleiman’s national dialogue; business and life go on (a sign of both, I’ve just opened Mamas&Papas), and ‘what doesn’t kill you makes you stronger’. On the other side of the balance sheet, more arms are flowing in; the state is struggling to deliver many services; the media anxious; borders porous; refugee numbers rising; sectarianism worse; the international community distracted by diplomatic jousting on Syria; and, perhaps, ‘what doesn’t kill you makes you more determined to kill your opponent first’. Wherever I go in Lebanon, people ask ‘what next?’. I have to disappoint them by saying that we don’t know either. Lebanon will continue to feel tremors from Syria. But a more pronounced breakdown is not inevitable if the Lebanese people resolve to avoid it. For Lebanon more than any other country in this troubled neighbourhood, the regional dynamic has the potential to make or break: we need to deliver a stronger consensus that regional and international players should avoid any action that undermines Lebanese stability. So I think UK actions should be guided by a simple principle: get the international community and Lebanese leaders to start treating Lebanon as an independent state with its own interests, rights and responsibilities, not eternally seen through the Syrian prism. Tricky, given the extent to which events in Syria are hitting Lebanon, but important. More specifically, we must build up practical support to Lebanon to help manage contagion from Syria, including through increased training for the army, and increased funding for Syrian refugees. We’re working to support police reform, and preparations for elections in 2013. We have projects to help the state reassert itself, and to develop a more effective relationship with the Palestinian camps. As Syria continues its transition, I hope therefore that we can focus in Lebanon on the opportunity to unshackle Lebanese talent. Like a nervous patient going to the doctor, we know that there could be some pain. But Lebanon will be stronger for a new and equal relationship with Syria and for a clearer commitment to Lebanese interests first. Unsettling it may be to adjust to it, but the future is in Lebanon’s hands. يميل لبنان إلى أن يكون على لائحة المراقبة التي نعتمدها لشهر آب (أغسطس). لكن في هذا العام، لم تشهد البلاد أزمة كبرى، إلا أنّ تطوّرات خمس رفعت من مستوى القلق فيها. فقد اتهمت اسرائيل حزب الله بتورّطه في الاعتداء الإرهابي الذي جرى في بورجاس، وتمّ توقيف وزير سابق من مناصري الأسد، وعادت موجات الاختطاف في غضون 48 ساعة خطرة، كما طلبت بعض دول الخليج من مواطنيها ترك البلاد، وعاد برميل بارود طرابلس إلى الاشتعال. وفي خضمّ هذه التطوّرات، أسرعت وسائل الإعلام إلى التشديد على السلبيّات. لقد تعلّم لبنان أن يعيش ضمن مستوًى محدّد من انعدام الاستقرار. فمنذ مئات السنين وهو يعرف فترات من الهشاشة والضعف بسبب الحركة الإقليميّة والتحوّلات الديمغرافيّة الحسّاسة. وغالبًا ما تكون النتيجة بالنزاع والاصطفاف السياسي. فهل وصلنا إلى هذه المرحلة؟ ليس بعد… لكنني أظنّ أن اللبنانيين أدركوا أنّ قدرة الأسد على التأثير على الحياة السياسيّة حاليًا قد انحسرت. فنظام الرعاية السياسيّة السوريّة الذي تصلّب على مدى 30 سنة بدأ يضمحل. لا شكّ في أنّ هذه المرحلة صعبة لكن لا بدّ منها. فالبلد يعيش ترددًا وخوفًا ومراجعة للحسابات. يسرع اللبنانيّون دائمًا إلى لوم الخارج على مشاكلهم عامة، لكن ما تغيّر تمامًا خلال الشهر المنصرم هو ظهور إشارات واضحة أنّ الطرفين في النزاع السوري أكثر استعدادًا اليوم إلى إثارة العنف في لبنان أو التجاوب معه ولا سيما في طرابلس. وكالعادة، ارتفعت حدّة نظريّات المؤامرة. أما المتفائل فرأى إيجابيّات: برأيه أحسن الجيش اللبناني بالاستجابة، ويحاول القادة السياسيّون الوصول إلى توافق آراء بما في ذلك من خلال الحوار الوطني الذي أطلقه الرئيس ميشال سليمان، كما أنّ الحياة العامة والأشغال لا تزال مستمرّة (والريهان أنني افتتحت للتو المتجر البريطاني ماماز أند باباز للاطفال) و هو يرى أنّ “ما لا يقتلك يقوّيك”. لكن في الوجه الآخر لهذه الجردة نجد عددًا أكبر من الأسلحة يدخل إلى البلاد والدولة تعاني الأمرّين لتأمين بعض الخدمات ووسائل الإعلام قلقة والحدود تعوثها الثغرات، وعدد اللاجئين إلى تزايد والطائفيّة تشتدّ والمجتمع الدولي مشغول بالنشاط الدبلوماسي في سوريا وربما “ما لا يقتلك يجعلك أكثر إصرارًا على قتل خصمك”. أينما ذهبت في لبنان، يسأل الناس: “ماذا بعد”؟ يؤسفني أن أخيب أملهم بالقول: نحن أيضًا لا نعرف. فلبنان سيشعر بالهزات الارتداديّة من سوريا إلا أن إمكانيّة تفادي الانهيار ممكنة إذا سعى اللبنانيّون إلى تفاديه. ولبنان، أكثر من أيّ بلد آخر في هذه المنطقة المضطربة يتأثّر بالحركيّة الإقليميّة: لذلك، لا بدّ من الوصول إلى توافق آراء أكثر صلابة بشأن عدم السماح للاعبين الإقليميين والدوليين بما يزعزع الاستقرار اللبناني. لذلك، أظنّ أن أعمال المملكة المتحدة يجب أن تتوافق مع مبدأ بسيط: دفع المجتمع الدولي والقادة اللبنانيين إلى البدء بالتعاطي مع لبنان على أنّه دولة مستقّلة لها مصالحها الخاصّة وحقوقها ومسؤوليّاتها والابتعاد عن النظر إليه من خلال الطيف السوري. هذا صعب نوعًا ما بسبب الأثر الذي نراه للأحداث السوريّة على لبنان، لكنّه أمر مهم جدًا. وبشكل خاص، علينا أن نستحصل على الدعم المهم للبنان حتى نساعده على مواجهة العدوى من سوريا بما في ذلك من خلال التدريب الإضافي للجيش والتمويل الإضافي للاجئين السوريين. نحن نعمل على دعم إصلاح الشرطة والإعداد لانتخابات العام 2013. لدينا مشاريع لمساعدة الدولة على إعادة تثبيت نفسها وعلى تطوير علاقة أكثر فعاليّة مع المخيّمات الفلسطينيّة. وبينما تستمرّ سوريا في مرحلتها الإنتقاليّة، آمل أن نتمكّن من التركيز في لبنان على فرصة الاستفادة من المواهب اللبنانية. الوضع أشبه بالمريض القلق الذي يذهب إلى الطبيب؛ نحن نعرف أنّ إمكانيّة الشعور بالألم ممكنة. لكنّ لبنان سيكون أقوى في علاقة جديدة مع سوريا والتزام أوضح بالمصالح اللبنانيّة أولًا. ربما سيتطلب حلّ الأزمة التكيّف معها وحسب، لكن في كل الحالات، المسألة بين يدي لبنان. 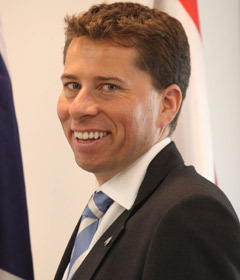 Tom Fletcher was appointed Her Majesty’s Ambassador to the Lebanese Republic in August 2011. Tom was born in Kent, and studied at Harvey Grammar School (Folkestone) and Oxford University (Hertford College), graduating with a First class degree in Modern History. He has an MA in Modern History, and is a Senior Associate Member of St Anthony’s College for International Studies, Oxford. He is married to Louise Fletcher and they have two sons, Charles (born 2006) and Theodor (born 2011). Tom enjoys political history, cricket (Strollers CC), and mountains, and is the co-founder of 2020 (a progressive think tank). Tom was awarded the Companion of St Michael and St George (CMG) in the 2011 New Year’s Honours, for services to the Prime Minister.